A one day Elephant Adventure tour followed by sleeping overnight in hammocks at our Jungle Lodge and then a full day jungle trek with a Bunong guide. PLEASE NOTE: This two day tour is sometimes done in reverse, with the jungle trek on day 1 and time at our elephant sanctuary on day 2. If you stay somewhere else in Sen Monorom we will pick you up from the main street of town at 8.20am. Drive to the starting point of the tour which offers views of the large area of forest which has been protected from logging by the Mondulkiri Project. First we walk from the hilltop into the jungle to the Mondulkiri Project’s Jungle Lodge. Here you will listen to your guide talk about the Mondulkiri Project. Next it is time to meet the 5 elephants and their Mahouts. 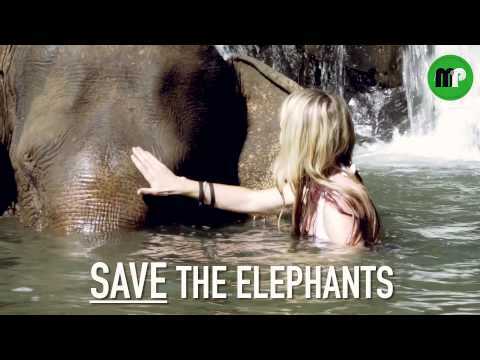 Take lots of photos, get close to the elephants and have fun feeding the elephants bananas. Watch as the elephants walk around eating bamboo and enjoying being elephants. After walking back to the Jungle Lodge it is time for lunch and relaxing in hammocks. The Lodge has great views over the jungle and is a good place to view wildlife and many species of birds. It also has a western toilet. In the afternoon we return to the bottom of the valley and walk to the waterfall to have a swim. It is time to have fun swimming and washing our elephants in the river to keep its skin clean and healthy and free from infection. Elephants really enjoy having a bath! We then walk to another deeper waterhole where we watch some other elephants playing in the mud and having a swim to wash themselves. After saying goodbye to the elephants we walk back through the jungle to enjoy the sunset over the Mondulkiri Project. You might be lucky and see wildlife such as monkeys, deer and many birds. Wake up, warm up around the campfire and enjoy breakfast at the Jungle Lodge with its lovely views over the Otey River. We start today’s Mondulkiri trek from the Jungle Lodge deeper into the jungle, first crossing our new log bridge across the Otey River. Our Bunong guide leads us through some beautiful jungle with many different types of trees, flowers, vines and beautiful stands of bamboo. You will pass by many Bunong farms within the jungle. Visit the impressive Leng Khin waterfall which is over 50 metres high. Lunch break at the jungle campsite alongside the beautiful Leng Ong waterfall. This is a lovely place for a swim. After lunch you will continue walking and then stop at a Bunong farm clearing and see cassava, chili peppers, lemon grass, wild rice, pineapples and cashew nut trees. Next we continue on passing by the large Leng Ret cave and Leng Ret waterfall. See some bats sleeping inside the cave. After more trekking through the jungle it is time to get your feet wet crossing the river. Now we will leave the river for one last climb out of the jungle before arriving at the Putang Village. Here see traditional Bunong long houses, children playing and pigs and chickens running around. From the village you will be picked up by car for the short drive back to Sen Monorom.